Nobel Prize–winning economist Joseph E. Stiglitz dismantles the prevailing consensus around what ails Europe, demolishing the champions of austerity while offering a series of plans that he maintains can rescue the continent?and the world?from further devastation. ...behaviour is something that economists struggle to capture. Joseph Stiglitz does better than most ... Stiglitz is contemptuous of the advocates of austerity within a single currency straitjacket ... Yet, having spent 300 pages dismantling the currency project, the author suggests it is still worth salvaging. The case he makes for a 'flexible euro' needs more detail in order to convince. Stiglitz’s indictments of the single currency, and his solutions to its supposed structural flaws, are conventional and also unconvincing. By contrast, his critique of specific policies is original and extremely helpful. If eurozone leaders took his advice on policy choices, they would disprove his bigger claims about the euro’s supposedly unsustainable structure. 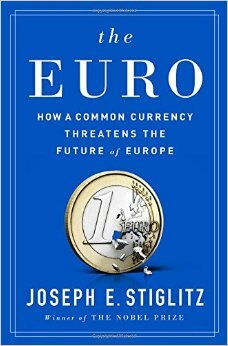 Early in the book, Stiglitz writes that he made a decision not to recount the birth of the euro, which is a shame, because this story is crying out for narrative, characters and nuance. Instead, Stiglitz has written a polemic, one that reads like a series of loosely stitched-together lectures ... Another downside to his style is that it strips the humanity out of the story. What did you think of The Euro: How a Common Currency Threatens the Future of Europe?